So you’ve got an idea for a project. You have a team to help you out, you know your goals and how you want to communicate, you’re starting to build an outreach list…sweet! You’re well on your way to creating a successful crowdfunding campaign. Now, you need to start thinking about how you’re going to share the story of your project, which starts with a strong campaign video (it’s the thing that usually takes the longest!). It’s the best way to share a message with a crowd, to create a story around your campaign, and to humanize your page and your project all at once. So let’s get started! 1. Use the right tools––and/or hire a professional. 4. Get to the point! 5. Tell a story (that also gives viewers all the necessary information). 6. Write a script and make a storyboard. At our core, humans are storytelling machines. We connect best to an idea when it has a narrative. When your campaign message reaches backers on a personal, intimate, individual basis, that’s when it can inspire them to take action. This lesson isn’t just valuable for crowdfunders: it’s critical for anyone trying to build a brand, promote their idea or project, connect with new audiences, and captivate people online. In other words, you always need to tell a great story. Here are my top tips for doing that. Here’s the first thing, and maybe the most important: please don’t sit in front of your laptop camera and shoot a video of yourself explaining why people should give money to your project. It’s tempting, I know—and so cheap. But don’t do it! You need to show the world that you take your project (and yourself) seriously, which starts with putting in effort and showing that you care. Rent the right equipment, or even better, hire a professional—because, let’s be real, you might not even know how to use that equipment by yourself. If you have no cash up front, try to get creative. Do a trade with a filmmaker friend. You might be able to work out a deal where you can pay them upon success of the campaign. 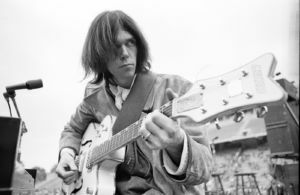 One of my most successful campaigns––The Pono Player by Neil Young––ended up raising over $6 Million on Kickstarter. It also broke my short video rule, with an 11 minute long video. Why did it work? Because Neil demonstrated the power of an audio product that backers couldn’t hear through a group of experts who conveyed it for him. You should watch it for yourself, but the video features some of the world’s top musicians listening to the PonoPlayer and reacting to it. There’s Norah Jones, Beck, David Crosby, Arcade Fire, Tom Petty, Anthony Kiedis, Elvis Costello, Reggie Watts, Eddie Vedder, and others. The video cuts from one incredible musician to the next, all talking about how much they love the PonoPlayer. It’s super engaging and beyond the star power, impressive to watch. Chances are, though, you won’t need 11 minutes to tell your story. In general, I recommend keeping your video length to under 4 minutes. If you communicate the most important information about your project within that period of time, potential backers can likely make an informed decision. Anything beyond that can be explained and expanded on in your project page. But also––don’t cut your video off mid-story because you’re trying to keep it short. Use your best judgment and share various cuts of the video with all kinds of people who can provide valuable feedback throughout the pre-launch process. Overall, your video should serve to set the stage and give audiences a live preview of what’s to come, draw them in, and get them to click that “Select this reward” button. Neil rockin’ out before clicking “launch” on Kickstarter. Probably the most straightforward step! But one that needs to be mentioned nonetheless. Make sure you hear from others about what they think about your video––it’s easy to get lost in a video hole where you lose perspective of how it sounds and looks from watching it over, and over, and over again. Reach out to friends, family, contacts, your creative circles––anyone who can give candid and constructive feedback. Then, incorporate that based on what’s possible, and what comments overlap the most from your feedback pool. Following point number 2––keep it short, get there, and bring it home. One of the most important pieces of advice I give to clients about their videos is to get to the most essential point of your project within the first 30 seconds. Otherwise, backers can lose interest. Be punchy, direct, and clear, right off the bat. It feels appropriate that this is the quickest piece of advice. Even though you love this project and you could ramble on about it forever, strangers may not feel the same way, and you have to draw in as many as you can right away. 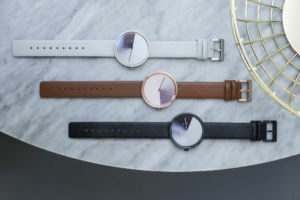 The Hidden Time Watch by Anicorn––time’s ticking! People want to be a part of your project. They want to feel a connection to it on a deeper level than if they were just shopping at a department store. This is one of the really special things about crowdfunding! And the best part is that you get to make them feel that way. In your video, create a story that shows how your experience is a journey and invite backers along for the ride. Campaign videos should typically address these core questions. • How did the project come about? • Where is it in development right now? • Why are you crowdfunding? • Where is the money going? If you have those answered in a clear and concise way, you’re golden. Give the people what they want! To start, let’s get this baby on paper. Create a list of the essential points you need to nail in the video, and then write a script. The script will include the key talking points for the video and an idea of who will say them (you, your partner creator, or someone else you’re interviewing for the video). What this will help you with is to make a clear beginning, a middle, and an end for your video, so it has a smooth narrative. Then, create a storyboard by adding what you plan to show on the screen to correspond with each part of the script. For you visual learners out there, this is your time to shine––tie in your words with some corresponding images that share your story, frame by frame, so you can get a clear visual of how your video is going to look. Getting from paper to production is often difficult, but don’t sweat it! Just stay organized. Making a script and storyboard also means that when you go to shoot and produce your video, you’re likely to be much more efficient with your time and costly resources. 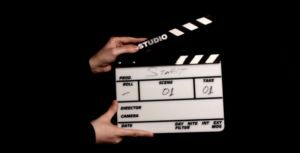 You’ll probably end up revising your storyboard after you shoot your interview(s), and that’s okay. The exercise is valuable for distilling your message, staying focused, and optimizing your time. 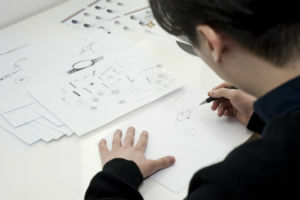 Think of your storyboard as an artist’s sketch––here’s designer Jiwoong Jung sketching designs for one of our campaigns with Anicorn. People are not just buying into your project, but you too. It’s key to show your genuine, authentic, passionate self in your video in order to establish a connection with potential backers. So be you! Of course, some of us are camera shy, and it can feel like a lot of pressure to get in front of a camera and share our projects. 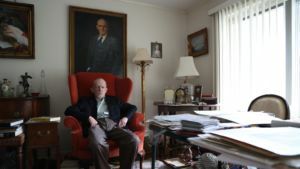 For our campaign to raise funds for the documentary Art and Craft, which follows one of the most prolific art forgers in U.S. history, the filmmakers were uncomfortable talking on camera. So they got creative—and had a little fun. They introduced themselves with a quick clip in the introduction and then asked their siblings to narrate the video. One is an actress, the other is a theater director, so they were a bit less camera shy! It worked out really well, and the video was a big success. So was the campaign. Finding a way to have your personality shine through your video doesn’t have to be hard, and can actually be pretty fun. Have a good time with it, get creative, and share with the world why they should join you on your journey. Mark Landis from Art and Craft. From my perspective, part of what compels backers to give is believing in something. It’s not about investing in a product as an exchange of money for goods; it’s about seeing and hearing a story that resonates. With that in mind, go forth and find a way to make people believe in you! It may seem like a daunting task, but I am confident it’s well within your reach. For more awesome tips like these, make sure you check out my complete write up in The Crowdsourceress––you won’t regret it!